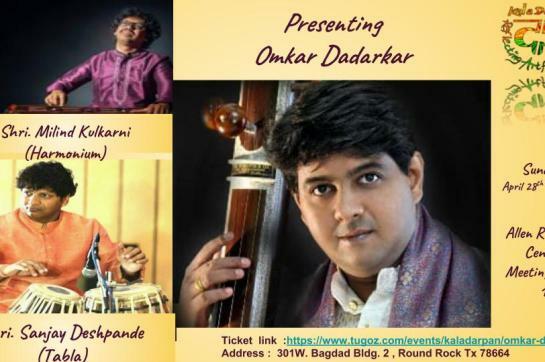 Kala Darpan presents Hindustani Vocalist Shri.Omkar Dadarkar in Austin! 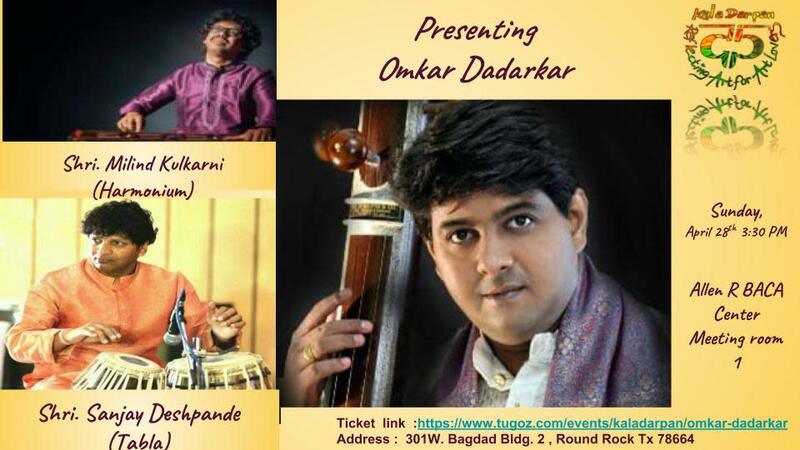 We are proud to announce the very first event of 2019 with the Spring concert by Sri Omkar Dadarkar. Shri. Dadarkar will be accompanied by Shri. Sanjay Deshpande on Tabla and Shri. Milind Kulkarni on Harmonium. Shri. Omkar Dadarkar is one of the finest renowned vocalists of the current generation. Born in 1977, he was initiated into music by his parents Shri. Shrikant Dadarkar and Smt. Shubhada Dadarkar. Later he took Taleem from Shri Ram Deshpande and Pt. Yashwantbua Joshi of Gwalior gharana. He was selected as a scholar at SRA Kolkata and received advanced training from the renowned vocalist Pt. Ulhas Kashalkar. He also had the privilege of learning from the renowned vocalist Smt. Manik Verma. He is the recipient of the prestigious Ustd. Bismillah Khan Yuva Puraskar from Sangeet Natak Academy, Vidyasagar award from the music forum and many more. He has performed all over the country in all prestigious music conferences. When globalization is firmly gripping the world making most of the modern society involved in material gold-rush, very few people maintain their originality and tradition. Omkar Dadarkar is one of them. For all music lovers this is a treat to ears and soul! It is definitely a unique event not to be missed!